Not many churches have more than one organ these days. However, in the past it was by no means so unusual for large churches to have two or even more organs in the one space. In France large churches often had a main organ, usually sited on a west gallery, and a smaller instrument in the Choir. In Spain, South Germany and elsewhere, it was not unusual to have two identical looking instruments either side of the Choir and possibly a third one elsewhere. The purpose was to lead singing of congregation and choirs in the different parts of the building for different liturgies. Even today one occasionally finds a large organ on a gallery at the rear of the church with a smaller one in the sanctuary. Here at Peachtree Road United Methodist Church (PRUMC), things are different. The large organ is in the chancel and the smaller one on the gallery. The style of the new organ is based loosely on the French Romantic style in contrast to the decidedly English slant of the Chancel Organ. The most famous French organ builder of the time was, of course, Aristide Cavaillé-Coll and the temptation is to suggest that any French romantic instrument is based on the work of Cavaillé-Coll. In reality, he shewed a wide variation in style over the years he worked, a point that is not always realised. His early work, particularly when it took the form of a rebuild such as at St Omer near Calais, displayed a remarkable classically orientated style. At the other end of the scale is the highly symphonic instruments such as that at St Ouen in Rouen. Whilst this latter style of instrument is fascinating, the instruments are a little limited in the repertoire that sits easily in their tonal concept. The earlier instruments are rather more versatile, particularly for the classical repertoire. An organ for day to day liturgical and recital use has, above all, to be versatile. The demands made on modern organs (and their builders) are extraordinary in requiring at least a musical rendering of almost all the vast and varied organ repertoire. So using an earlier rather than later Cavaillé-Coll organ as a starting point makes sense. No specific instrument was used as a model, but one might imagine it as what might have evolved from a rebuild of a classical French organ in the first half of his long career. Some stops (perhaps mixtures and pedal 8 and 4ft reeds) might have been retained from the original instrument and skilfully integrated into the new work. That at least has been our aim. In scaling the pipework for the new organ, we have looked to published Cavaillé-Coll scales. The reed pipes have been constructed along the French style, with considerable use of the characteristic double blocks. Otherwise, the construction of the organ is in the usual traditional manner including the employment of genuine bellows rather than modern regulators and (of course) mechanical or tracker action. Of perhaps special note is the carving of the pipeshades above the front pipes of the organ. As well as the sun and the moon which can be clearly seen, are the instruments of the 150th Psalm. These are in the carving at the top of the three towers of the casework. The lower centre tower has the church's shield. Other pipe shades have dogwood. All have a relevance to Peachtree Road United Methodist Church in some way or another. Giving the carving a story to tell adds a dimension to it and the organ. From a distance, it merely looks like part of the organ but, when looked at from closer to, the differences in each element and what they tell can be appreciated. Although both organs at Peachtree Road are mechanical, they are connected electrically. The Gallery organ can be played from the main console with all the stops available on the console and transfers which can assign the gallery organ to a variety of manuals of the main console. This was planned from the inception of the main organ. However, it was also felt that it would be useful to control the main organ from the new gallery organ console, so a system was devised whereby the General Pistons of the main console could be called up and operated from the gallery console. This allows pistons set on the chancel console to be used as "blind" combinations on the gallery console to play either or both organs. The organ was opened in a wide ranging concert on 25 January 2009. The main soloist was David Higgs who put the new organ through its paces. But the PRUMC Chancel Choir also took part, conducted by Stephen Kennedy with Scott Atchison on the main organ and Nicole Marane on the gallery organ. 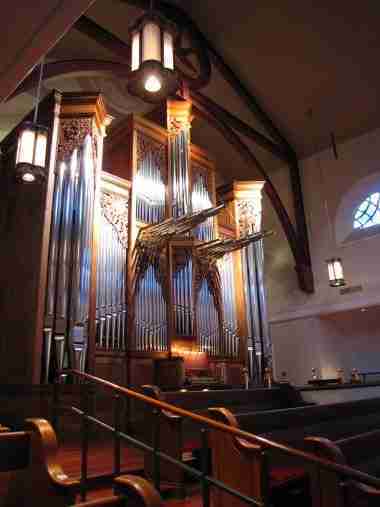 View the Specification of the Peachtree Road Gallery Organ, UMC (completed 2008) and pipe scales.